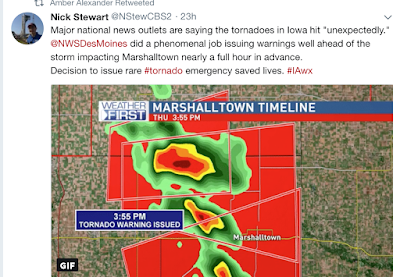 MSE Creative Consulting Blog: "No Weather Advisories Interrupted the Program"
In inland towns and cities, where the weather did not dictate the day’s activities, radios were tuned into CBS Studio Nine. Correspondent William Shirer was reporting from Berlin that Hitler had just won his first slice of Czechoslovakia. At eleven o’clock, under intense pressure from Britain and France to concede or fight alone, the Czechs had capitulated. Was it “peace in our time,” or “base betrayal”? CBS correspondent Ed Murrow was standing by in London for a live broadcast with Anthony Eden. No weather advisories interrupted the program. 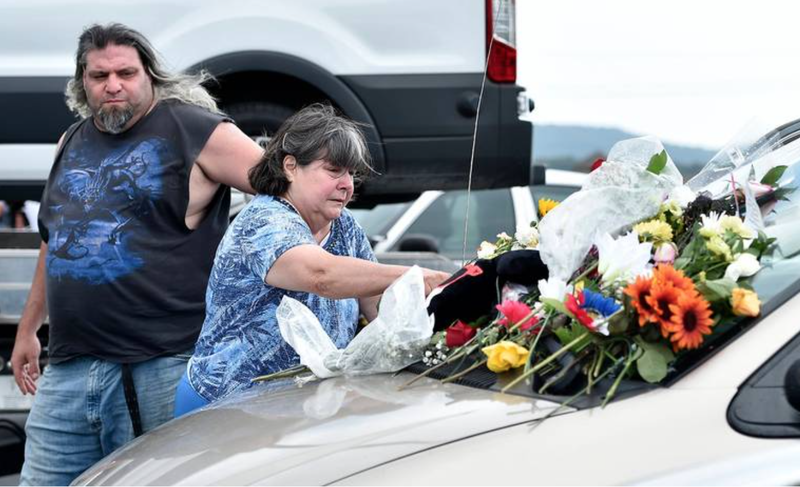 The exact death toll from that storm is not known but it is believed to be around 800. The hurricane's storm surge caused water in downtown Providence, Rhode Island, to rise to a depth of 17 feet. I imagine the grieving family and friends of those killed by the Great Hurricane wished there had been an effective storm warning system that would have allowed them to protect themselves, their families and their communities. Fast forward eighty years. Weather scientists in the United States have developed the finest storm warning system in the world. It is not perfect (I plan to write more about that in the next few weeks) but most of the time it works well. 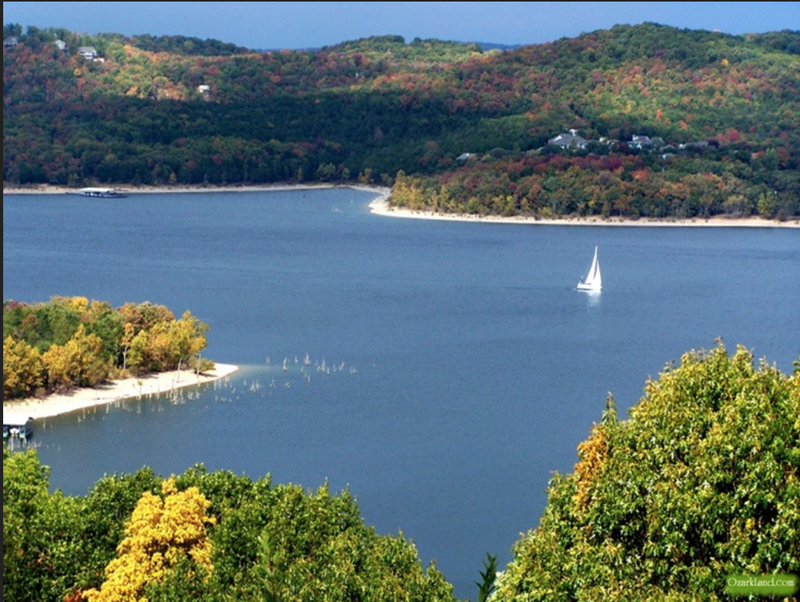 The system to warn of dangerous weather at Table Rock Lake, Missouri, worked as it was supposed to Thursday. A NWS severe thunderstorm watch -- that explicitly forecasted winds of 75 mph -- flashed across television screens, set off NOAA Weather Radios, and triggered smartphone apps eight hours before the sinking. 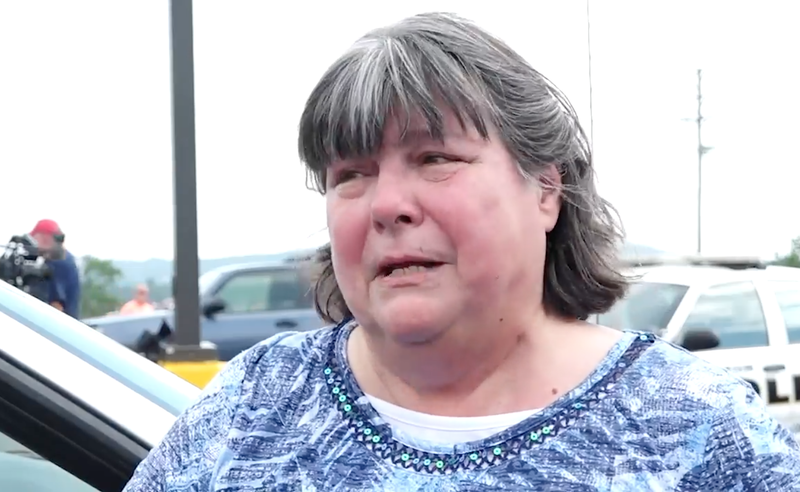 There was a severe thunderstorm warning calling for 60 mph winds issued by the NWS office in Springfield more than thirty minutes before the sinking. There was also an update to the severe thunderstorm warning that increased the forecast winds to 70 mph before the sinking occurred. Those messages also triggered smartphone apps, television, radio, NOAA Weather Radios and other outlets for storm warnings. As I wrote below, businesses that are affected by weather should hire a commercial weather company that specializes in warning of extreme weather. While I cannot speak for the others, AccuWeather Enterprise solutions explicitly warned its clients at Table Rock Lake of winds of "70+mph" in plenty of time to take action. 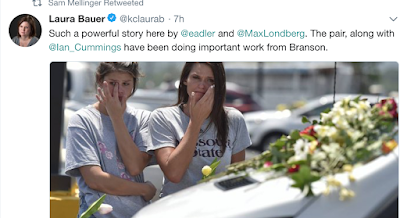 I'm certain 100% the people involved in the "ducks" tragedy, if they had it to do over, would have inquired as to whether there were any warnings of dangerous weather and, once so informed, they would never have launched the duck boats. Just hours prior to the catastrophe at Table Rock, there were weather warning success stories. 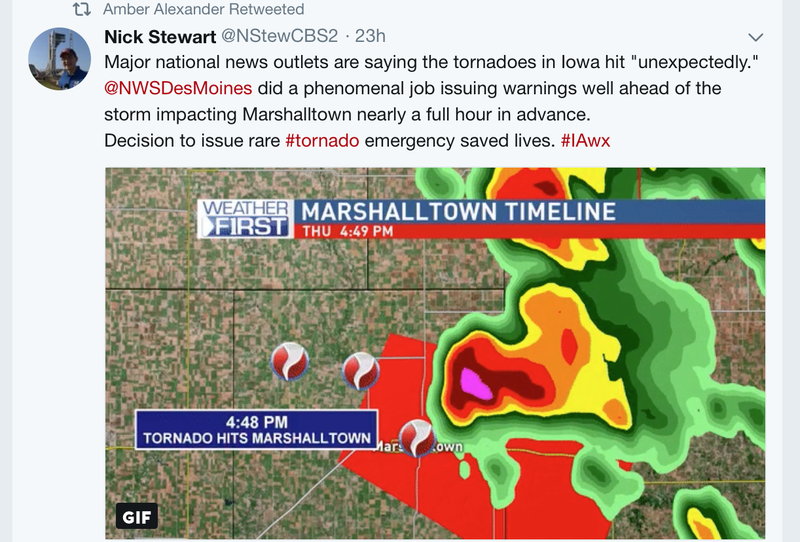 For example, Marshalltown, Iowa, suffered a damaging EF-3 tornado that affected the entire city. The advance warnings -- 50 minutes' worth -- almost certainly saved lives. In the pre-warning era, that type of tornado would likely have killed dozens. The death toll Thursday was zero. 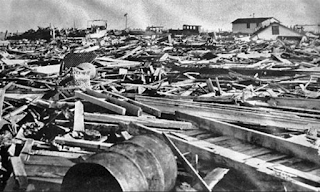 In spite of the successful warning of the three major 2017 hurricanes to strike the United States, the incredibly accurate forecasts of the extraordinary flooding associated with Hurricane Harvey, and tornado warnings in Iowa Thursday, weather science does not receive the respect it has earned and, consequently, too many people fail to respect and act upon the warnings. Why?? It was this very question, in the months after Hurricane Katrina (which killed 1800 people) -- and the utterly unfair criticism of the storm warnings -- that caused me to write my first book, Warnings: The True Story of How Science Tamed the Weather. The book was published in 2010. We chose the title because we thought it was vital to get the point across that, while we have not conquered the weather, we have unquestionably tamed it. In Warnings I discuss how the once-frequent downburst-related airline crashes have ceased, how hurricanes are forecast with incredible accuracy and how tornado warnings are made. 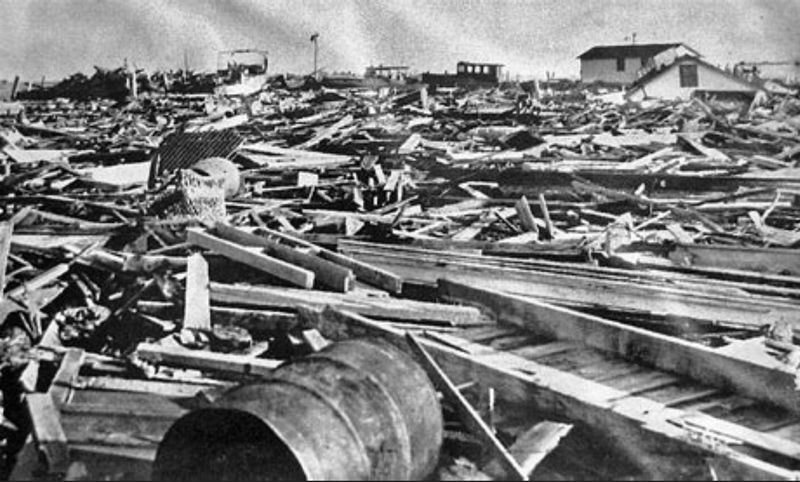 While it is not discussed in the book, I imagine that, with effective warnings, the Great Hurricane of 1938's death toll would probably have been in the double digits, not 800. Pictures like the ones below (via the Kansas City Star) affect meteorologists greatly. I had thought that smartphone apps would make a tremendous difference in the behavior of people who have received warnings. The apps work well as evidenced by the tweet. It was tweeted during the Iowa tornado outbreak just hours before the Table Rock catastrophe. With the smartphone apps like AccuWeather's, false alarms are significantly reduced. 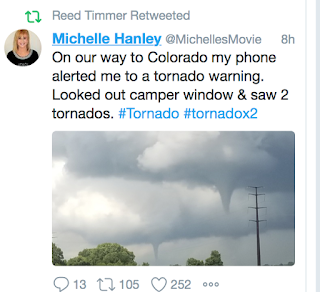 It keeps track of your location and, as in Ms. Hanley's case, it alerts you if you are moving into danger or if the storms are moving toward your location. No more countywide storm warnings that don't apply to the user's location. 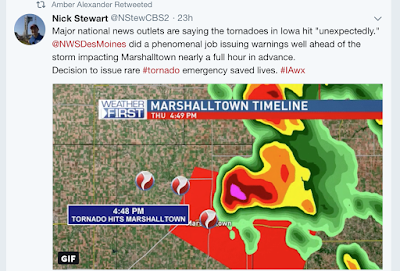 Yet even with the revolutionary step-up in accuracy and specificity of smart phones and television storm warning systems, too often storm warnings are treated like a curiosity and not something to be acted upon. That usually changes if the user "confirms the threat" (in the words of social scientists) such as by looking out the window and seeing a dark cloud. But if the sky appears to be unthreatening, too often a warning is not acted on. I've wondered if that was the issue Thursday. Based on media reports, literally no one at the lake seemed to be aware of the threat before the boats left land. [Please see addition below] I checked the weather observations at the Branson airport 20 minutes before the sinking and the weather would have been described as "partly cloudy." The satellite image clearly shows there was still sunshine. 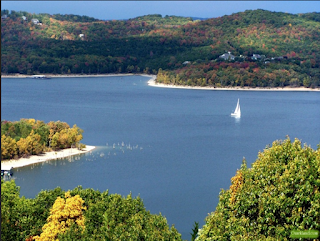 The terrain around Table Rock Lake is rolling hills. 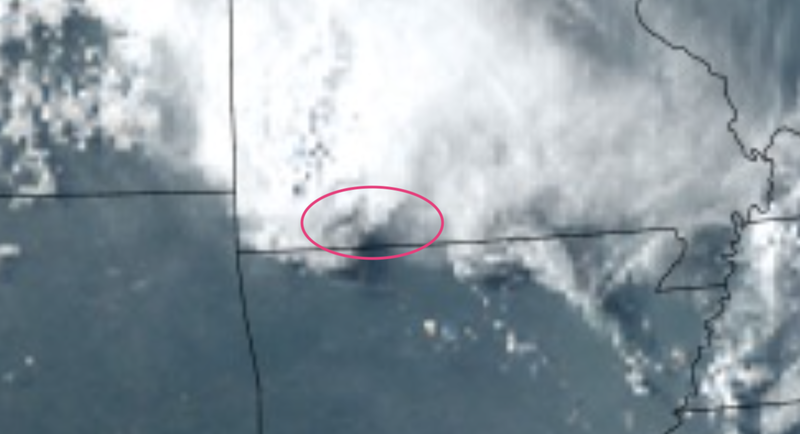 Unless they were looking, they probably didn't see the gust front/shelf cloud rapidy approaching -- the line of storms was moving southeast at 50 mph -- from the north. So, I am speculating (please note that word) that sunshine at 6:32pm Thursday cancelled out, in the minds of many, the warning of imminent dangerous weather. Even though we have social scientists working with meteorologists, I do not know how we go about ratcheting up the credibility of storm warnings so they are acted upon regardless of how cloudy the sky happens to be when the warning is received. It seems to me that is the key question going forward. Storm warnings are useless unless they are acted upon. Thursday evening demonstrates we still have a lot of work to do.